We’d love your help. Let us know what’s wrong with this preview of Established by Dark Angels. 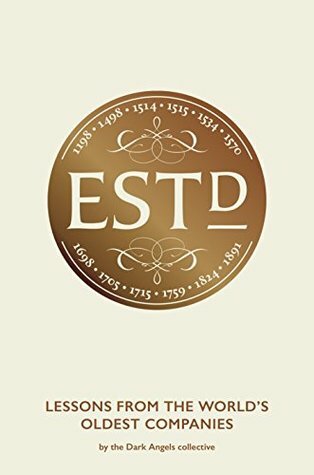 From the oldest pub in the world to the Liberty Bell and the origins of a nation, Established: Lessons from the World’s Oldest Companies tells the stories of twelve businesses with a combined age of almost 5,000 years. They’ve survived war, plague, rebellion, boom, bust, depression and strange twists of fate. But how and what can we learn from them? Spanning the local and the global, family businesses and household names such as Guinness and Wrigley, Established seeks to uncover the secrets behind the longevity of these twelve remarkable institutions. This is a book with points to make through stories told; all reinforced by photographs, many of them historic. At a time when the average lifespan of a business seems shorter than ever, the companies included here stand as living testaments to the value of rich, compelling stories in a world of quick-fix branding. To ask other readers questions about Established, please sign up. Established is written by Dark Angels – a writers collective dedicated to creative wirting for business, allowing business writers and communication professionals to improve their writing skills and escape the clichés of business writing. It was published by Unbound using their crowd-sourcing funding model, and I was one of those who pre-funded this book. As an aside it is perhaps appropriate for this book, that Unbound’s publishing model actually goes back to the la Established is written by Dark Angels – a writers collective dedicated to creative wirting for business, allowing business writers and communication professionals to improve their writing skills and escape the clichés of business writing. It was published by Unbound using their crowd-sourcing funding model, and I was one of those who pre-funded this book. As an aside it is perhaps appropriate for this book, that Unbound’s publishing model actually goes back to the late eighteenth century. Superficially the set-up of this book is similar to Jim Collins's highly influential business book Built to Last: Successful Habits of Visionary Companies, in that it examines the story of long established companies and what lessons can be drawn from them. Perhaps not surprisingly given the aims of Dark Angels, the resemblance largely ends there. Whereas Built To Last focused on firms established for 50+ years but at the time of publication, influential market leaders (many of whom infamously have suffered hubris-fueled falls since the book was written); this book seeks out the Oldest Companies in the English speaking world – many of whose longevity can probably be traced to the modesty of their ambition. Further, again as can be expected given Dark Angels credo, the writing is far removed from the dry, pseudo-intellectual tone of business books, and genuinely concentrates on the stories around and behind each company with each chapter having a different author, each with their own styles. Some of the firms were at least known to me – Cambridge University Press (one of the least well executed chapters), Berry Brothers Wine Merchants – and two Wrigley and Guinness are household names. One could quibble over the first two choices – a Dublin pub which has stood on the same spot since 1198 and whose chapter is more of an Irish history, and a Thames Ferry operating since 1514 but whose daily takings are around £5 but nevertheless this was a fascinating read. Very very educational. I would highly welcome a follow-on focusing on different business in other parts of the world! I very much enjoyed the essay format and even more the different styles each author applied to the same format.